Whether you’ve purchased a new TV recently, moved house, or just want to make the most of your living room space, mounting your TV on the wall is nearly always a good idea. But if you’ve searched online for information on TV wall mounts and TV brackets, you might be feeling a tad overwhelmed. So, how do you figure out what kind of TV wall mount is right for your TV? In this article, we’ll talk about the different factors to consider when choosing a TV wall mount and how to make sure you get one that’s exactly what you need. 1. How Big Is Your TV? This question is essential because you’ll need to choose a TV bracket that’s strong enough to securely mount your TV. All TV wall mounts have weight limit guidelines, so you’ll need to check that your TV doesn’t exceed the limit on the brackets you’re looking at. If your TV is extra large, you’ll need a heavy duty wall mount. It’s also worth considering details like the hole pattern on the back of your TV, which enables you to bolt it onto your TV bracket. You’ll need to make sure these holes will match up with the TV bracket or it won’t fit. 2. What Is Your Wall Made Of? Gyprock or plasterboard is the most common wall material in Australian homes these days. Fortunately, attaching a TV wall mount to this kind of material is usually pretty straightforward, as it’ll come with all the hardware you need to fix it to your wall. But if you’ve got brick, timber, or stone walls, you’ll likely need to get some extra hardware that’s compatible with your wall. 3. Will It Go On a Straight Wall, In a Corner, Or On the Ceiling? You can choose from standard TV brackets, ones that are designed for corners, or even brackets to mount your TV from the ceiling. So consider how you’d like to position your TV before you order your wall mount. 4. Do You Want Your TV To Rotate Or Swivel? You don’t have to fix your TV at a single angle – there are plenty of flexible TV wall mount options out there. There are brackets that enable you to rotate and swivel your TV, both horizontally and vertically, so you can view it at different angles. But if you can hang your TV at the perfect height, you don’t need to fiddle with the ports at the back of your TV very often, and you don’t need to change the angle, you might only need a fixed TV wall mount. 5. How High Will You Position It? You’ll usually find it more comfortable to watch TV if it’s positioned at around eye height. But if you’d like to wall mount your TV up higher, consider getting a TV bracket that allows you to change the angle. This will help make your viewing experience more comfortable, even with your TV mounted up high. 6. How Will You Hide Any Cables? Ideally, you’ll mount your TV as close as possible to a power source and TV point (and even connect these directly through your wall), but you’ll still need to manage the cables and ensure they don’t look messy. Some TV wall mounts come with extra features like a cover to help tidy and hide your cables. 7. What Do You Want It To Look Like? Even though it’s installed behind your TV, your wall mount will still be visible from the side, and the design of your wall mount will affect how close your TV sits to the wall. For the most minimalist, understated look, go with a slim mount so your TV can be positioned as close to the wall as possible. What Are the Different Types of TV Wall Mounts? Fixed TV Wall Mount – While this option doesn’t allow for any movement, it’s usually the most slimline option to install your TV close to your wall. Tilting TV Wall Mount – Tilt your TV angle up or down for better viewing. Sliding TV Wall Mount – You can slide your TV out, away from the wall, and then swivel it in different directions. Tilt & Swivel TV Brackets – Tilt your TV angle up and down, as well as swiveling it from side to side. 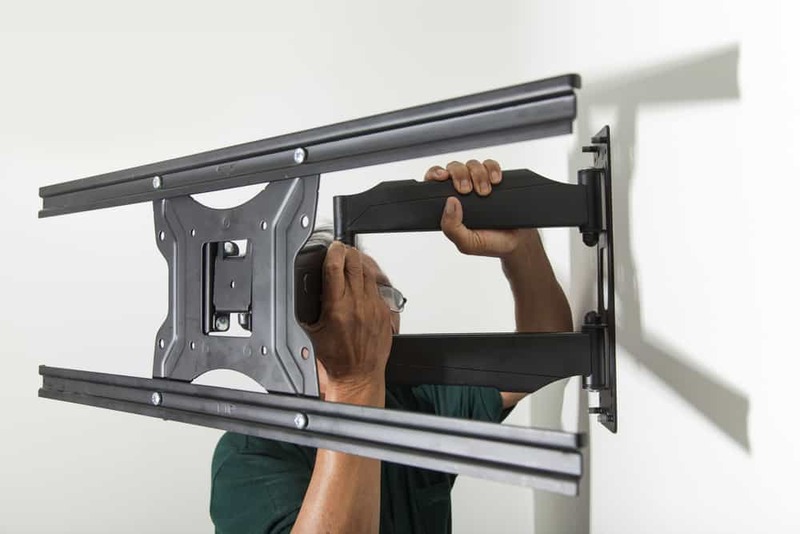 Full Motion / Articulating TV Brackets – Move your TV in any direction, including out (away from the wall), up, down, side to side, and even a slight rotation to get it level. Corner TV Brackets – Specially designed for corners, you can mount your TV between two walls and angle it for best viewing. Ceiling TV Wall Mount – Hang your TV from the ceiling with a height-adjustable ceiling bracket. How Do I Know That My TV Wall Mount Will Hold My TV? You should be able to find information on the weight and size of your TV device on the packaging it came in. But if you’ve recycled your packaging already and can’t find the manual, do an online search to find the specs on the manufacturer’s website. Then compare these specs to the limits listed on the TV wall mount you’re considering. Usually, you’ll see a maximum load weight listed, and in some cases, a suggested maximum TV size. Can Any Flat Screen Be Wall-Mounted, Or Do I Need a Special Kind? To find out the dimensions of your TV, you can either check your manual for the specs or measure the distance between the holes yourself. The first number is the measurement from the left hole to the right hole, and the second number is the measurement from the top hole to the bottom hole. When choosing your TV bracket, you’ll need to make sure it fits your TV model and hole pattern. Do I Need a Professional To Do a TV Wall Mount Installation? While there are plenty of DIY kits on the market, it’s generally best if you let the professionals take care of it for you. Unless you’re a carpenter, builder, or cabinet maker by trade, you likely won’t have the skills, experience, or tools to do a professional and safe job. Plus, if you’ve never installed a TV wall mount before, you won’t always know what features to look for and how to choose a quality product. You could waste a lot of money (and time) if you buy the wrong TV bracket and hardware. You could even damage your wall, your TV, or hurt someone with a falling TV if it’s not secured properly. You can read more in our previous blog, Why Customers Want a Professional TV Wall Mount Installation. But to sum it up, you’ll save time and get a safe, quality job done by hiring a professional like our technicians at Install My Antenna. Will a Professional Installer Provide All the Hardware Needed Or Do I Need To Purchase It Ahead Of Time? If you’re booking a professional to install your TV wall mount, you won’t need to buy a thing except for the TV itself. We always bring all the tools and hardware with us, including the TV bracket. In fact, it’s better if you get your TV bracket through a professional because they’ll have access to the safest, most reliable, and most heavy duty ones on the market. And because they’re direct from the manufacturer, they’ll often sell them to you at a better price than you can get from retailers. Remember, when you call Install My Antenna’s TV Wall Mount experts – we will bring the hardware to your home for you! Our team of experienced technicians will call and ask you a few simple questions, so you know they’re bringing the proper supplies for your TV. We will install your wall mount and make sure the job is done efficiently and safely.